Gennady “Genndy” Borisovich Tartakovsky (b. 1970) was born in Moscow. His family escaped the Soviet Union to Italy when he was still a child, and were soon forced to move again after experiencing tremendous anti-Semitism. They ended up in Chicago, where Tartakovsky grew up, enjoying his new-found comic books, American cartoons, Japanese anime, and comedy shows. Tartakovsky had a difficult youth. He was made fun of for being an immigrant, and always felt like an outsider. His father passed away when he was a teenager, and the family barely scraped by living in subsidized housing. Although he wanted to be a businessman and get his family out of the gutter, Tartakovsky was placed in an animation class and decided this was his life’s work. He would go on to study at the prestigious California Institute of the Arts in Los Angeles. After finishing his studies, Tartakovsky got a job in Spain working on a Batman cartoon. His big break came when he was hired by Hanna-Barbera and given the chance to come up with a show. Tartakovsky brushed off an old student project, Dexter’s Laboratory,which ended up on television and became hugely popular. It won three Annie Awards and was nominated for four Emmys. It would later be ranked among the 100 best cartoons and credited with launching ” a new generation of animated series that played on two levels, simultaneously fun for both kids and adults.” Tartakovsky then co-produced The Powerpuff Girls, followed by the hit Samurai Jack, which won him an Emmy and was also ranked among the 100 best cartoons. Tartakovsky’s shows boosted the Cartoon Network’s viewership from 12 million to 72 million. In 2005, Tartakovsky was hired by George Lucas to direct Star Wars: Clone Wars. The show won three Emmy Awards. 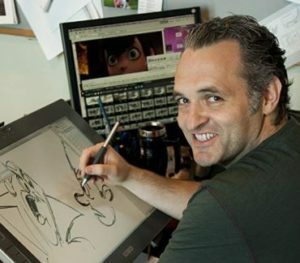 In 2012, Tartakovsky made his film debut with Hotel Transylvania (originally created by Todd Durham), which was nominated for Best Animated Feature at the Golden Globes. Hotel Transylvania spawned two sequels, earning the trilogy nearly a billion dollars at the box office. Tartakovsky has worked on many other films and shows, including The Flintstones and Iron Man 2, and even wrote and illustrated for Marvel Comics. The key to a good comedy cartoon, he says, is writing with parents in mind and remembering that kids are really smart, too. I see Star Wars as taking all the issues that religion represents and trying to distill them down into a more modern and easily accessible construct… I put the Force into the movie in order to try to awaken a certain kind of spirituality in young people – more a belief in God than a belief in any particular religious system. This entry was posted in Arts & Entertainment and tagged Annie Award, Batman, California Institute of the Arts, Cartoon Network, Cartoons, Chicago, Dexter's Lab, Emmy Award, Hanna-Barbera, Hotel Transylvania, Immigrants, Iron Man, Marvel, Powerpuff Girls, Russian Jews, Samurai Jack, Star Wars on July 19, 2018 by Jew of the Week.